For Milwaukee’s Hispanic immigrants and native-born Latino population, Cesar E. Chavez Drive, formerly known as South 16th Street, has been a popular stop for decades. 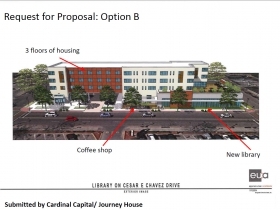 But, said Julio Maldonado, executive director of the Cesar E. Chavez Drive Business Improvement District (BID), “The street has never really been sold as a destination.” In other words, patrons don’t stay there for long. Maldonado’s team is working to transform the long-stagnant business district, which runs between National and Greenfield avenues. Partners include nonprofits Journey House, the Clarke Square Neighborhood Initiative (CSNI) and Newaukee, as well as local businesses. They’re calling it the “Farm Project” and the plan is to seed arts, culture and small businesses to turn the street into a lugar (place), where South Siders can say, “Me Gusta” (I like it). That’s the new slogan, and plans are in the works to place a statue of Chavez on the street and to activate open spaces on the street for arts and other public programming, among numerous projects. Cesar Chavez was a Mexican American civil rights leader and labor organizer who died in 1993. “We’re talking about churches holding public mass on the street; businesses having sidewalk sales,” said Jeremy Fojut, chief idea officer at Newaukee. Fojut has been working with the BID and other groups to plan and raise money for the project. 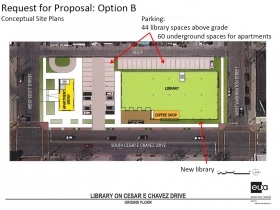 Newaukee will fund an artist in residence, who will live on the street and work with business owners to create public art installations.The crown jewel of the new development would be a new library to replace Forest Home Library, 1432 W. Forest Home Ave., and named after Chavez. 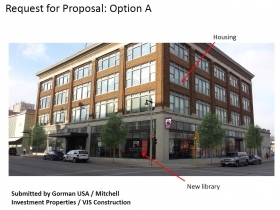 Organizers from Journey House, CSNI and Cardinal Capital Management Inc. put together a proposal for the new library, which would be located between Scott and Washington streets where Dental Associates of Milwaukee, 1135 S. Cesar E. Chavez Dr., is currently located. 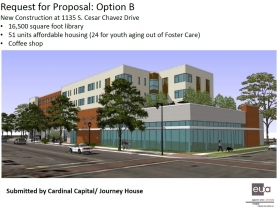 The proposal includes a mixed-use facility that would also house businesses and 51 residential apartments, most of which would serve youth transitioning out of the foster care system. 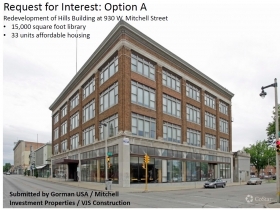 Gorman & Company, an Oregon, Wis.-based developer, has proposed repurposing a building at 9th and Mitchell streets to house the library as well as apartments. 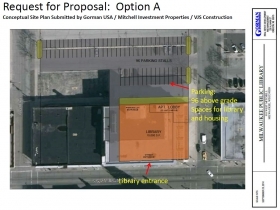 A complete rundown of the two library proposals can be found here. Ian Bautista, executive director of CSNI, said it’s an exciting time to be a part of the neighborhood, adding that quality real estate such as the library would be a big boost for development in the area. “It’d be a big draw with its close proximity to all the schools in the surrounding neighborhoods,” Bautista said. The initiative evolved from small ideas to a catalytic project, said Maldonado. And big projects need big money. The goal is to raise at least $300,000, which excludes the cost of the library, and the fundraising is ongoing, Maldonado said. If all goes as planned, the street will look drastically different within a few years. 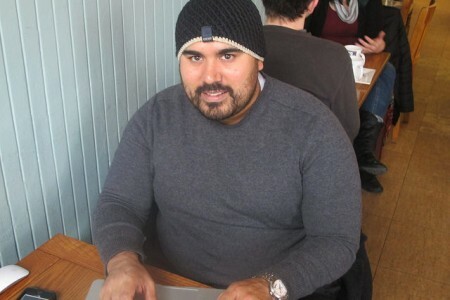 Maldonado hopes to unveil the statue of Chavez on May 15, the activist’s birthday. “The library and other projects will help the business community and culture thrive on the street,” Maldonado said.